After an exciting night of racing in what is quickly becoming one of my favorite parts about the Nationals Logan Schuchart, Brian Brown, Paul McMahan, Matt Juhl, and Dominic Scelzi have earned starting spots in Saturday’s A-Main after two of the best features I have seen all season. Here are five takeaways from the night’s program. 1. 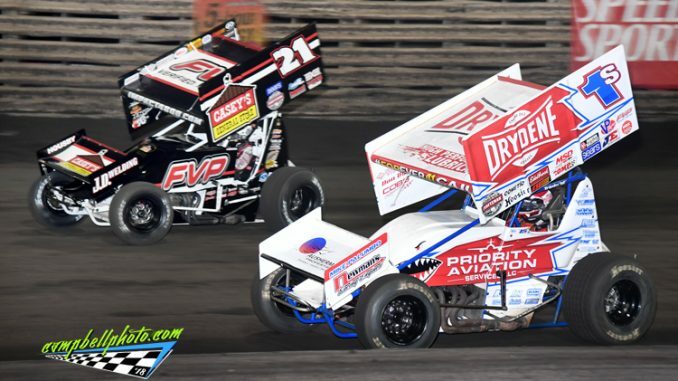 You would be hard pressed to find two better feature events than the two we witnessed on Friday night at Knoxville Raceway. Brian Brown and Logan Schuchart traded the lead back and forth multiple times before Schuchart pulled away in traffic late in the event. Behind them Matt Juhl, Sheldon Haudenschild, and Jamie Veal had a torrid battle for the fourth and final transfer spot. 2. Friday was about Nationals and career comebacks. Logan Schuchart 100% owned his mistake of not going to the scales following the B-Main on his preliminary night and could not have bounced back stronger than his victory on Friday at Knoxville. Schuchart more than earned the victory battling Brian Brown for a majority of the event for the victory. Throw in Schuchart’s grandfather Bobby Allen being admitted to the hospital on Friday for observation (which he’s expected to be released from on Sunday) Friday’s win caps off an emotional roller coaster for Schuchart and his family. Paul McMahan has endured a brutal couple of seasons in the sprint car world. McMahan had to hustle after losing the final transfer spot, then using a tremendous restart to build momentum and eventually secure the third spot around Matt Juhl to cement his spot in Saturday’s A-Main. While McMahan has been written off by many people in the sport but put together a solid season with Tom Buch this season. Now McMahn, Buch, and their crew of “misfits” are now in Saturday’s A-Main. Many questioned Brian Brown’s decision to scratch from his qualifying night following a vibration that was a cause for him time trialing in the 38th position. For a while those critics appeared to be right when Brown continued to have issues through Friday’s program. After a multitude of changes and an effort by Brown’s team he referred to as the hardest he’s ever seen the problem was solved. Brown then did his part driving the car into Saturday’s A-Main. 3. Small mistakes are magnified at Knoxville Raceway. Sheldon Haudenschild bobbled once on the berm and that’s all it took to give Knoxville regular Matt Juhl enough distance to hold on to the final transfer spot. Haudenschild will now have to work his way through a stacked B-Main to make Saturday’s Nationals finale. 4. The new Friday format is one of the best additions ever to the Knoxville Nationals. All of the stories mentioned above are way better than the old format where the story line for the winner was, “Congrats for winning, you get to start 11th in the C-Main.” While several drivers including ones that did lock in are still not in favor of the newer Friday format, the racing and drama it produces is stellar. While I wasn’t a fan at first of the winner of the World Challenge locking into the A-Main, I feel its important to have to entice international teams to compete at Knoxville and for American drivers to go to Australia to race during our off season. Having someone earn a 25th starting spot in the Knoxville Nationals is a small price to pay for what this event does to help sprint car racing on an international scale. 5. The emotion shown by Dominic Scelzi shows how much just making the A-Main for the first time means to the drivers. Scelzi brought the World Challenge trophy back to the media room and was as excited as any Nationals A-Main winner that I have ever witnessed. One of the most fun parts of this job is seeing that kind of reaction when someone accomplishes a lifelong dream and being able to write about that moment.